Saffron Tree: Who Built the Pyramid? Egypt and pyramids are probably one of those places where even a non-history buff gets excited. Is it because they are part of the popular culture in Western world with the Hollywood movies, mystery and fantasy books featuring the pyramids, curses and mummies? Irrespective of the reason, it is one of the few things or places about history that is not considered boring. With a lot of literature that involves pyramids in the pop-culture, it is more accessible and it has become one of the greatest revenue generators for Egypt. Some of the revenue indicators in Wikipedia says that tourism was almost 12% of the GDP of the country. A visit to British Museum will indicate how popular the mummies and the history of Egypt is. There is probably a downside of all the references to pyramids and mummies in popular culture. The truth sometimes gets buried among the mystery, curses and fantastical elements associated with them. This is where the books like 'Who Built the Pyramid?' helps a lot. It is a great primer on the background of the pyramids and about the people behind the pyramid and how they are built. 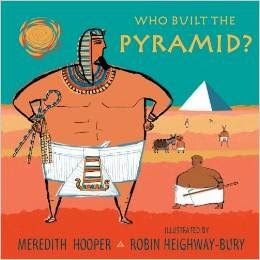 This picture book is about the pyramid built for the king Senwosret, from the so-called middle Kingdom of Egypt between 1918 and 1875 BC. The story starts with King Senwosret telling us the readers that he was responsible for building the great pyramid because every one does what he says; but, his Chief Minister Montuhotep disagrees (with us and not the king though!) and says that he was responsible and so does his High Priest Imhotep who thinks he is the architect of the pyramid as he decided where it needs to built and it what direction it should be pointing. And it goes on. Every one stakes a claim on who is responsible for pyramid, including the Wah, the water carrier and his donkey. If your kid is more interested in books that talk in more detail about how the pyramids are built, do check out David Macaulay Pyramid. I have not read this book, but if his book called Mosque (a fictional story of building a Mosque in Turkey) is anything to go by, this book would be amazing. Huge Meredith Hooper fans here, so will definitely get thi sone from the libe. Thanks for an awesome review. And yes David Macaulay rocks. Have one of his books called Cathedral, among several others. So yes, bet the one about pyramids will be excellent as well.